Goa lies on the western coast of the Indian peninsula. Its allure is the fact that it is a delightful mash up with a dash of its Portuguese past, Anglo-Indian heritage and its present role as a tourist haven in India. When all of India sparkles and glitters with lamps and lanterns. Goa, adds its own flavor to the festival of Diwali with its Narkasur festivities. Narkasur was a demon who was defeated by Lord Krishna in a battle. Goa celebrates the victory of good over evil by burning narkasur effigies. 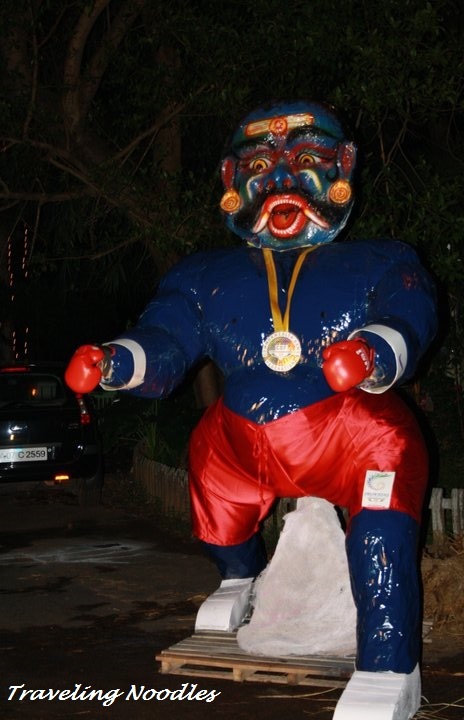 Narkasur effigies are made all over Goa with each year witnessing different themes and contests. The effigy is then taken in a procession and burnt at dawn to usher in the festival of Diwali. The legend goes that Krishna washed away all the blood after the battle by bathing with scented oils giving rise to the Diwali ritual of bathing at dawn. Also the women who were held captive by Narkasur, when freed from captivity lit lamps to usher in good and to signify the defeat of evil. All across India there are many legends on the origins of Diwali with different ways of celebration in different parts of the country. Which is a true testament to the ‘unity in diversity’ stance of the country. 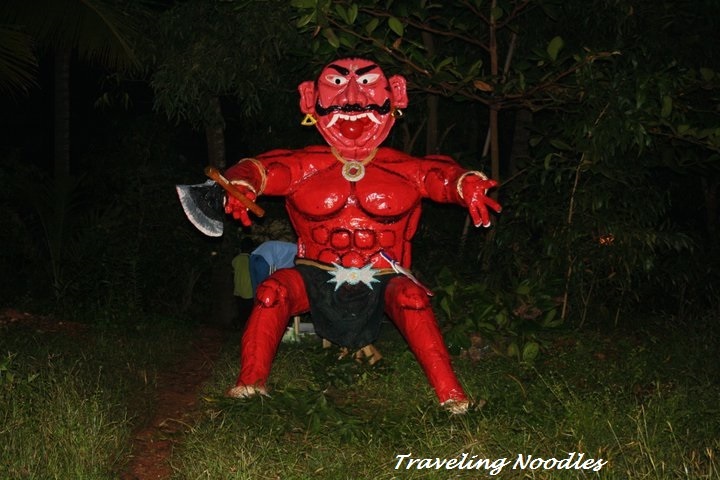 Goan beaches are famous but if you find yourself in Goa during diwali you are bound to get caught up with Narka Chaturdashi celebrations and the burning of Narkasur effigies. The year we spent Diwali in Goa, we saw effigies made on the common wealth games that India hosted that year and the many scandals it generated. The themes are usually current and popular themes of the year and the competitions and scale of the effigies grow every year. All photographs copyright of Traveling Noodles and credited to Razor Rasu.